You are here: Home / In Relationships / Family / Happy Birthday, Dr. Seuss! Theodore Seuss Geisel, lovingly known as Dr. Seuss, is celebrated today for his beloved books. He was born in 1904, 112 years ago today, and his legacy lives on across the world. *Some of the links below are affiliate links, meaning, at no additional cost to you, I will earn a small commission if you choose to make a purchase. Thank you for your support in this way! We have had Dr. Seuss books in our house for as long as we have had children. The first few books were thrift store finds and we have slowly grown our collection. When I decluttered our books, we kept our Dr. Seuss books! We all love the books and we range in age from 6-44 years old! Dr. Seuss books never get old for adults to read to children who are pre-readers, and they are perfect for children who are just starting to read independently. My oldest son loves Oh, The Places You’ll Go. This is particularly poignant as he graduates middle school and begins high school next year. My youngest son loves What was I Scared of? My favorite is his defining book The Cat in the Hat. Did you know the book was the result of a challenge from his publishers to write a story using only 225 “new reader” vocabulary words? Pretty cool. I not only love the stories and colorful illustrations of Dr. Seuss books, but I love the fact that Dr. Seuss’ first book, And to Think that I Saw it on Mulberry Street, was rejected 27 times before finally being published! That encourages me to persevere despite rejection. Dr. Seuss books are timeless and a worthwhile investment for children of all ages. What’s your favorite Dr. Seuss book? Let me know in the comments! Sharing at these awesome link ups. I love that one too Christy. My youngest son said to me that he thought the ending was too abrupt on the Lorax and we talked about how the story continues with you and me. We love Dr. Seuss, too! My personal favorite is Oh, The Places You’ll Go!, but my kids are pretty obsessed with One Fish, Two Fish. Dr. Seuss is such a classic! Loved all the books but I have to say The Cat In The Hat is my favorite. 🙂 Thanks for sharing on the Small Victories Sunday Linkup! Dr. Seuss is definitely a classic that “sparks joy!” They pass the Kondo test so they get to stay! I love Green Eggs and Ham and One Fish Two Fish Red Fish Blue Fish; but let’s face it all of his books are great fun. It’s true! They are ALL fun to read and listen to! Oh the places you’ll go is my fav.. I love that fact about Dr. Suess being rejected. It definitely motivates me to keep going! Me too Lara. I love success stories like that – it helps when you’re in the midst of rejection! I love them all but I tend to favor Green Eggs and Ham because it’s the one we read the most when I was a kid. My favorite is Oh The Places You Will Go! Such a classic. 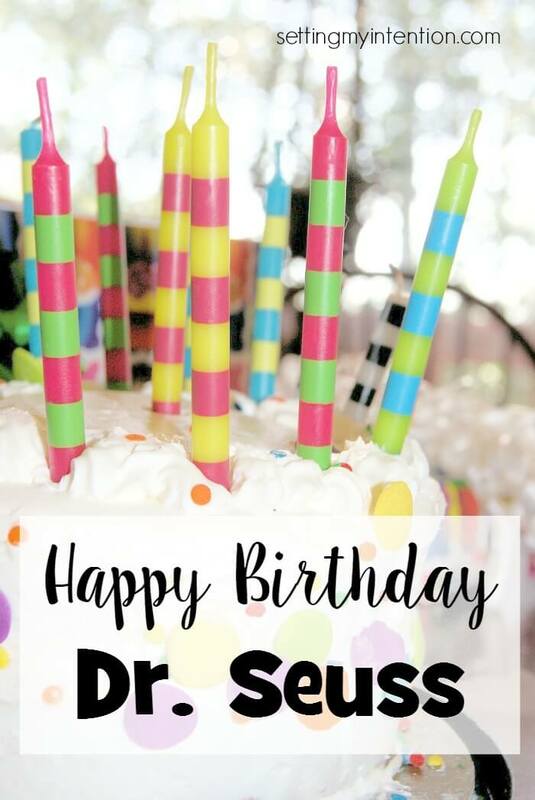 Love celebrating Dr. Suess’ birthday! I’m a Cat in the Hat fan, love Dr. Seuss books!